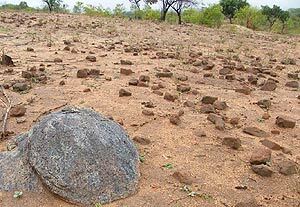 The Chaseyama project base is an example of what the implementation of permacultural techniques can accomplish in a low rainfall region: a desertified area was reclaimed, turning bare land with sandy soil into productive land. It demonstrates the wise use of ecosystems in dry land cropping areas, the conservation of bio-diversity and natural resources, and is a highly realistic adaptation of more generic principles for the target groups. Read about how it all began in PORET'S history. A typical view of the landscape of the region: after deforestation and exploitive agriculture, the top soil is carried away by rainfall waters and wind, leaving a depleted, very sandy landscape that is open to the evaporation of any water that may be in the ground. Under such conditions, the cultivation of crops becomes increasingly difficult. 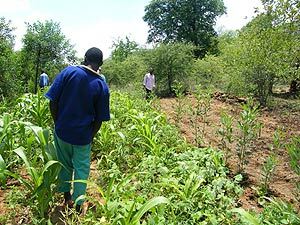 What the landscape can look like after applied permacultural planning takes effect: cropping between rows of shading trees and shrubs becomes easier as erosion is stopped, moisture is preserved, and ground cover with mulch improves soil fertility. A self-sustaining system with high value output is created. At Chaseyama, many solutions have been successfully implemented over the past years, and there are many further projected ideas aimed at further improving the site as well as at becoming living examples of how the region's challenges can be met with a minimum of input to generate a maximum benefit.